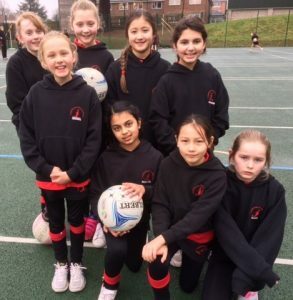 The squad of Emi, Freya, Tal i, Tia, Emily, Macie, Tanishka and Sophie played a very competitive game of netball on a wet and blustery afternoon. Cumnor House had brought three very tall girls who intercepted many passes in the first half causing Copthorne to be behind 6-2 at that point. After a further team talk the girls then realised that the only way to put passes together was to dodge and come in front of their opponents. The girls then managed to get the score back to 8-5 by the end of the match. Although Copthorne lost they played really well – supporting each other and playing in a sporting manner.